The death toll from Severe Typhoon Hato rose to at least 16 Thursday after the storm left a trail of destruction across southern China. 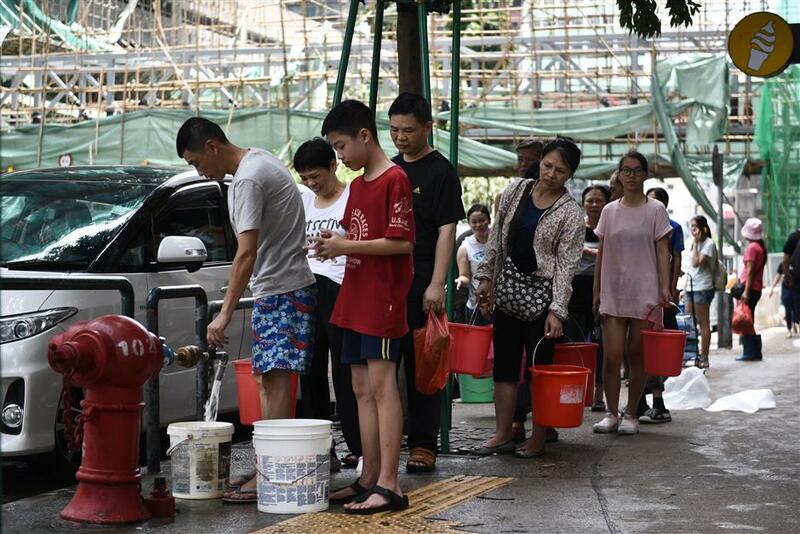 Residents queue up to collect water from a fire hydrant in Macau on August 24, 2017, a day after Typhoon Hato hit. The death toll from Severe Typhoon Hato rose to at least 16 Thursday after the storm left a trail of destruction across southern China, blacking out Macau's mega-casinos and battering Hong Kong's skyscrapers. Eight died in the gambling hub of Macau, where local media showed cars underwater and people swimming along what are normally streets. Macau's famed mega-casinos were running on backup generators. A man was killed after being injured by a wall that blew down, another fell from a fourth floor terrace and one was hit by a truck. The Macau government said two bodies were found in a flooded carpark early Thursday, but details on the remaining victims were not immediately available. Footage published Thursday on the website of Apple Daily showed water gushing into an underground carpark, with people wading through neck-deep water littered with debris as one man shouted in panic. It was not clear if it was the same carpark where the bodies had been found. "I have never seen Macau like this since I came here in the 70s," a taxi driver aged in his 50s who gave his name as Lao told AFP. He added he thought authorities had reacted too slowly and did not do enough to alert residents of the coming storm. "It's like they were trying to gamble with their luck... because Macau had been lucky before," he added, saying there was not enough time for residents to prepare or buy groceries. Macau's sprawling Venetian casino resort had been on back-up power Wednesday and without air conditioning or proper lighting, according to one source. A member of staff at the Grand Lisboa Hotel in central Macau told AFP Thursday that it was still without electricity and water and that its casino and restaurants were closed following the typhoon. The city's gambling industry generated over 220 billion patacas (US$27.29 billion) in revenue in 2016, over half of its annual GDP, as it hosted more than 30 million visitors. AFP reporters saw debris scattered on roads, with a shipping container washed up on its side on one street in front of a temple. Residents holding plastic buckets were also seen queuing for water from fire hydrants. Ferry services between Macau and Hong Kong resumed Thursday morning but passengers said they experienced delays. In Hong Kong, Hato -- whose name is Japanese for "pigeon" -- sparked the most severe Typhoon 10 warning, only the third time a storm of this power has pounded the financial hub in the past 20 years. The city could have suffered losses of HK$8 billion (US$1.02 billion), Chinese University of Hong Kong economics professor Terence Chong told AFP, referring to the value of its daily GDP. More than 120 were injured as the city was lashed with hurricane winds and pounding rain. However, one 83-year-old man earlier thought to be a victim of the weather had committed suicide during the typhoon. In the neighbouring southern Province of Guangdong, at least eight people have died, state broadcaster CCTV reported, while around 27,000 were evacuated to temporary shelters, Xinhua news agency said. Nearly 2 million households were briefly without power. CCTV said four of the mainland deaths had occurred in Zhuhai, three in Zhongshan and one in Jiangmen. In Zhuhai, which borders Macau, some 275 homes had collapsed, with the typhoon causing an estimated 5.5 billion yuan (US$826 million) in damage, according to state-run Beijing News.